I am very happy to upload the fourth "over-the-pond" online collaboration with my dear friend Dean. 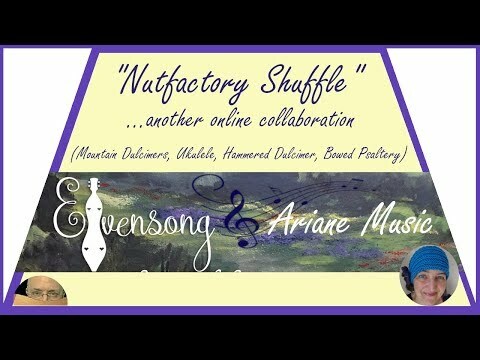 This time we chose the well-known "Nutfactory Shuffle", a tune by Gil Anderson, and added some instrumental improvisations. where you can wish for a tune! auf der Sie sich ein Lied wünschen können! Terry - thank you very much - I am very happy that you liked it. Thank you very much, Glenda and Cynthia - I am very happy that you like it. You two are super and your instruments are so beautiful! Luigi and Jim - many thanks for your kind comments. What a treat to be able to collaborate across the globe and share this experience! Thanks Ariane for the wonderful video production. I'd like to give a shout out to @bradford-jennings at Black Peak Studio for this dulcimer. It's his Kurviga model in Paduk and Redwood. When I was recording this tune, I had a horrible ground loop (that awful hum you sometimes hear when wires are crossed somewhere) and could not find it for the life of me. So I grabbed a Zoom H2n digital recorder and clamped it directly under the camera and recorded using only its stereo microphone. That's it. No processing. Just an amazing wonderful tone straight from the dulcimer's mouth so to speak. Thanks Bradford!